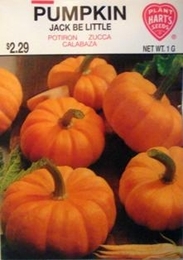 A true miniature pumpkin averaging just 2 inches high and 3 inches in diameter. Small enough to fit in the palm of your hand. The deep orange, ribbed fruits will last up to 12 months if fully cured on the vine. 330 Seeds/oz. Plant 1/2oz per 100ft row.